Project Summary: 50/50 is a new art venue constructed from two shipping containers, and activating vacant urban space in the West Bottoms. It will provide a platform for fostering progressive dialogues between an equal mix of local and national artists, with an emphasis on exhibiting experimental, emerging to mid-career artists across varying disciplines. In addition, 50/50‘s Digital Archive will pioneer as Kansas City’s first interactive web-based curatorial platform allowing for less immediate audiences to engage in new ways. A related billboard will serve as an exhibition and lecture site. Project details: 50/50 was conceived with the desire to diversify Kansas City’s art ecology by introducing progressive dialogues through collaboration, utilization of alternative building materials and 21st century technology. The concept of 50/50, of two parts equaling one whole, is represented not only in the psychical structure itself but through the ways in which the concept is integrated into curatorial programs. For example, 50/50‘s version of a ‘solo’ show will always feature two artists. In addition to showcasing local and national artists equally, 50/50‘s Digital Archive will draw in more remote audiences. 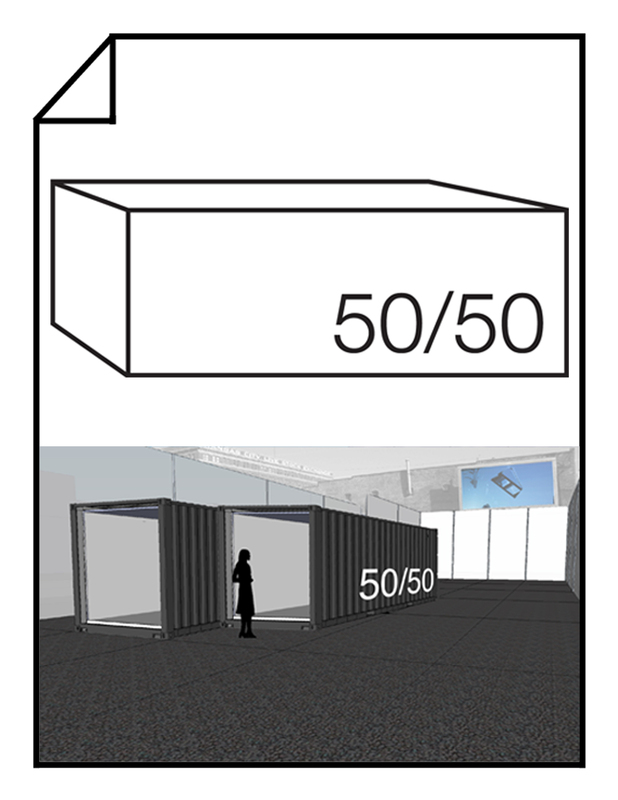 50/50 has four equivalent platforms for curatorial programming: exhibitions, the Digital Archive, the billboard & lectures. There will be six exhibitions a year, with the Digital Archive placing them online and supplying additional research and information, as well as providing an interactive platform. The billboard series will provide an additional space for artists to display work related to the current exhibition, and will also serve as a projection site for pertinent engagements with lecturers and local moderators. 50/50 uses collaboration as its main source of community impact. Currently, 50/50 is collaborating with the Kansas City Design Center, a group of ten students from the University of Kansas and the University of Kansas City Missouri. Through this collaboration, new ideas are developing to architecturally transform 50/50 from two shipping containers into a destination. This collaboration has furthered the conceptual development of the space and serves as a learning opportunity for KCDC and 50/50. After construction, collaboration will continue on a local and national level to strengthen exhibitions and programming. The space is aiming for a January 2015 opening. Cambria Potter is a multi-media artist and arts administrator residing in Kansas City. Having received a B.F.A. degree in Painting from the Kansas City Art Institute, Cambria’s work has remained primarily curatorial in practice. As the Youth Program Specialist for the School of Continuing and Professional Studies at KCAI, Cambria spends her days programming, marketing, and fostering partnerships within the community. Her interest in arts-based community outreach stems from her experiences as a gallery assistant at the Longview Cultural Arts Center, and at Cara and Cabeza’s Contemporary – where she was responsible for building relationships with new audiences, in addition to her operational and curatorial work.